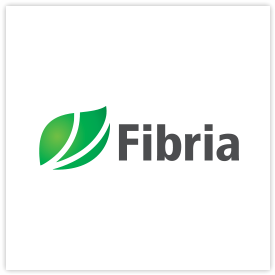 The world leader in eucalyptus pulp production, Fibria is a Brazilian company that strives to meet, in a sustainable manner, the global demand for forestry products. Its annual pulp production capacity of 5.3 million tons is spread across operations located in Aracruz, Jacareí and Três Lagoas, as well as in Eunápolis, where it operates Veracel. Fibria has 1,056,000 hectares of forests, including 633,000 hectares of planted forests and 364,000 hectares earmarked for environmental preservation and conservation. The pulp produced by Fibria is exported to more than 40 countries to be used in educational, health and hygiene products.